Ibacus peronii (left) and Ibacus alticrenatus (right). Photographs by David Paul. Abstract. To test whether palinurans share a common ground plan of distal leg motor neurons with other decapod crustaceans, I examined the distal leg motor neurons in the scyllarid species Ibacus peronii and Ibacus alticrenatus. By backfilling the distal leg nerves individually, a total of about sixteen cells fill are seen, distributed in three clusters in the ganglia: an anterior cluster of about twelve, a posterior cluster of three, and a single medial cell. Although one medial cell fills when distal leg nerves are filled separately, two cells that are similar to two medial inhibitory cells in non-palinurans are visible in more proximal fills. The neural map is similar to those described for other species, suggesting that the distal leg motor neuron grand plan is conserved across reptantian decapod taxa. Crustaceans have provided multiple models for understanding the neural basis of rhythmic behaviour, such as tailflipping (Edwards et al. 1999, Krasne & Edwards 2002), swimmeret beating (Skinner et al. 1997), digestion (Harris-Warrick et al. 1992), and walking (Clarac 2002, Ayers 2004). One advantage of studying walking is that the innervation of decapod crustacean thoracic limbs (hereafter “legs,” which includes claws) has been profitably studied since the late nineteenth century (Atwood 1976, Wiens 1989). Because of the ease of removing claws, many studies used the peripheral innervation of the leg muscles to study synaptic physiology (reviewed in Atwood 1976, Atwood 1977). The discovery of presynaptic inhibition in crayfish claws (Dudel & Kuffler 1961), which proved to be an important and widespread mechanism (Atwood & Tse 1993, Clarac & Cattaert 1996), was but one example of the success of this research program. Although the properties of the peripheral synapses have been well studied, there has been less work on the anatomical and physiological properties of these neurons within the thoracic ganglia. There are many reasons to suspect that there is a common plan for the distal walking leg motor neurons in decapod crustacean. Early work on peripheral innervation of the muscles suggested a common plan for excitatory innervation (Wiersma 1941, Wiersma & Ripley 1952), and a common plan for inhibitory innervation was revealed later (Wiens 1989; Figure 1). Uniformity across a wide range of taxa was also shown in the central anatomy of the distal leg motor neurons in a comparative study of four species of different infraorders and locomotor styles (Pacifastacus leniusculus, a walking astacidean; Munida quadrispina, a walking anomuran; Blepharipoda occidentalis and Emerita analoga, both digging anomurans). All four species have seventeen cell bodies in three clusters, in agreement with data based on peripheral innervation (Figure 1): an anterior-lateral cluster containing twelve cell bodies, a posterior-lateral trio of cell bodies, of which one is found in more dorsal plane in the ganglion than the other two, and a posterior-medial pair of cell bodies (Faulkes & Paul 1997). Indeed, the inhibitory motor neurons in decapod crustaceans and insects are so similar that they were proposed to be homologous (Wiens & Wolf 1993) at a time when the proposed sister relationship between insects and crustaceans was much more speculative (Averof & Akem 1995) than it is now (Regier et al. 2010). Figure 1. Innervation of muscles in reptantian decapod crustaceans (reductor excitatory innervation: (Wiens 1993); excitatory innervation of remaining distal muscles: (Wiersma & Ripley 1952); inhibitory innervation: (Wiens 1989); accessory bender: (Vidal-Gadea & Belanger 2009); excitatory innervation of proximal muscles: (Bévengut et al. 1983, Moffett et al. 1987, Skorupski & Sillar 1988, El Manira et al. 1991, El Manira et al. 1991, Pearlstein et al. 1995). The accessory bender muscle was only recently identified in the first pair of legs (usually chelae) in several species (Vidal-Gadea & Belanger 2009); its innervation is unknown. Triangles represent excitatory synapses; circles represent inhibitory synapses; neurons shown within circles represent larger pools of motor neurons (6-19 cells). Dotted line shows distinction between “distal” muscles on right and “proximal” muscles on left. Abbreviations: PRO = promotor; RET = retractor; ELV = elevator; DEP = depressor; RED = reductor; EXT = extensor; FLX = flexor; aFLX = accessory flexor; STR = stretcher; BND = bender; aBND = accessory bender; OP = opener; CL = closer. There are variations in the neuromusculature, however. For example, clawed lobsters (Homarus americanus) have a rotator muscle that has not been found in other species (Wiens 1990, Wiens & Govind 1990). Because the rotator shares innervation with the flexor muscle, this additional muscle does not change the number of motor neurons present in H. americanus compared to other species. Segmental variation is apparent in several crabs and crayfish species, which have an accessory bender muscle in the first, but not more posterior, pairs of legs (Vidal-Gadea & Belanger 2009). The innervation of this muscle is unknown. Perhaps the most significant challenge to this hypothesized common ground plan is posed by a description of the distal leg motor neurons in the spiny lobster species Jasus edwardsii (called Jasus novaehollandiae in that paper; Silvey 1981). J. edwardsii also has three clusters of cell bodies, but the anterior-lateral cluster contains eleven cell bodies instead of twelve, the posterior-lateral cluster contains four cell bodies instead of three, and the posterior-medial cluster contains only one cell body instead of two. Efforts to reconcile these numbers with older peripheral data (Wiersma 1941, Wiersma & Ripley 1952) led to the hypothesis that these differences were due to the absence of an opener inhibitor (OI) and the replacement of the stretcher inhibitor (SI) in J. edwardsii, and perhaps other species in the taxa (Faulkes & Paul 1997). The OI and SI neurons have important functional roles in movement, because the opener and stretcher muscles have only one excitor shared between them; thus, the opener and stretcher muscles cannot contract independently without specific inhibition (Wiens 1989, Wiens 1993). Such a change in the central positions of distal leg motor neurons would be surprising given the consistency described above. Additionally, such variation in the motor neuron population may make it difficult to harmonize the substantial behavioural data on walking collected in spiny lobster (Clarac et al. 1978, Chasserat & Clarac 1983, Clarac & Chasserat 1983, Cruse et al. 1983, Clarac 1984, Müller & Clarac 1990, Müller & Clarac 1990, Clarac 2002) and the physiological data on the central control of walking collected in crayfish (Sillar et al. 1986, Chrachri & Clarac 1987, Chrachri & Clarac 1990, El Manira et al. 1991, El Manira et al. 1991, Cattaert et al. 1995). Data on such neuronal variations may inform longstanding phylogenetic debates. Schram (1986) memorably described the phylogeny of reptantian decapod crustaceans as a “morass,” a lack of consensus that was more recently echoed by (Ahyong & O’Meally 2004). Several major hypotheses of the relationships between the major reptantian decapod lineages are shown in Figure 2. The divergent arrangement of leg motor neurons (Silvey 1981) would be more readily explained if palinurans were in a basal position (Scholtz & Richter 1995, Ahyong & O’Meally 2004) rather than a more derived one (Dixon et al. 2003, Porter et al. 2005), nested between the astacideans and anomurans, both of which have been previously studied (Faulkes & Paul 1997). Figure 2. Recent hypotheses of decapod crustacean relationships. A. Phylogeny based on Figure 1 in (Scholtz & Richter 1995) and Figure 3 in (Ahyong & O'Meally 2004). B. Phylogeny based on Figure 7 in Dixon et al. (2003). C. Phylogeny based on Figure 2 in Porter et al. (2005). 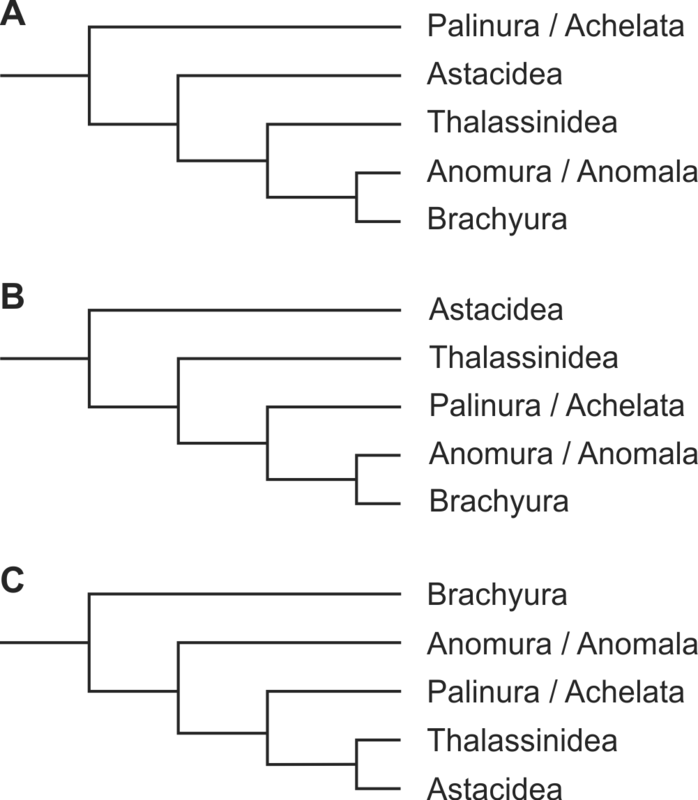 “Palinura” is used here, but it equivalent to “Achelata” for the purposes of this paper, because both clades contain Palinuridae and Scyllaridae. 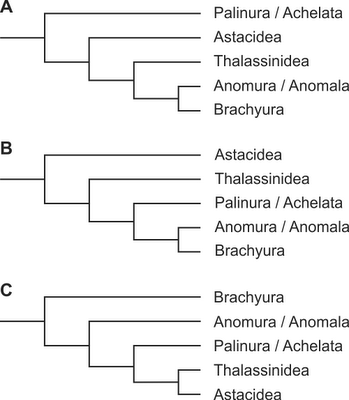 Palinura includes Polychelidae and Glypheidae, but Achelata does not (Ahyong & O’Meally 2004); neither family is relevant to this project. Similarly, “Anomura” is used here, but is equivalent to “Anomala,” because both have been used to refer to Galatheoidea, Hippoidea, Lomoidea, and Paguroidea (McLaughlin & Holthuis 1985). To test the hypothesis that distal leg motor neurons share a common ground plan across the reptantian decapod crustaceans, I examined these neurons in slipper lobsters (Decapoda: Palinuridae: Scyllaridae). If scyllarids showed the same map of distal leg motor neurons as spiny lobsters, it would show that palinurans generally have a different map of distal leg motor than astacideans (crayfish) and anomurans. Live Ibacus peronii Leach, 1815 and Ibacus alticrenatus Bate, 1888 (hereafter, “Ibacus” refers to both species) were bought from a local commercial seafood supplier (Briarry’s Seafood Connection, Queen Victoria Market, Melbourne) and housed in the University of Melbourne’s seawater system. They were provided with sand to dig in, and fed squid. All housing and experiments complied with the animal care guidelines of the University of Melbourne and the laws of Australia. Animals were anaesthetised by chilling for at least 30 minutes before dissection. Dissections were performed in chilled seawater. I removed the abdomen at the thoracic-abdomen joint, trimmed the protruding carapace, and then pinned the head and thorax ventral side up in a dish lined with Sylgard (Dow Corning Corporation). The dorsal exoskeleton and viscera were removed to expose the ventral nerve cord. The nerves connecting the cord to muscles and limbs were severed, and the entire cord was transferred to a dish containing fresh seawater. In this study, thoracic ganglia are numbered from anterior to posterior, with the first (T1) innervating the first pair of walking legs (homologous to the ganglia innervating claws in species that have them, e.g., crayfish), T2 innervating the second pair of walking legs, and so on. The nomenclature of leg nerves is based on (Elson 1996) and is the same as that used previously (Faulkes & Paul 1997). Because the branching patterns of proximal leg muscle nerves are complex (Bévengut et al. 1983, Elson 1996, Antonsen & Paul 2000), and characterizing this in Ibacus was not the aim of this project, the proximal legs motor neurons were not investigated in detail. I used cobalt backfilling (Pitman et al. 1972, Altman & Tyrer 1980) to visualize leg motor neurons. The primary reason for using this technique was to ensure comparability with previous work (Silvey 1981, Faulkes & Paul 1997). Cobalt backfills provide very high quality visualization of neuron anatomy, particularly marine decapods. Although it is difficult to quantify, cobalt backfills appear to provide consistently higher quality results with marine crustaceans than freshwater ones (e.g., crayfish). The nerves of the five thoracic ganglia were backfilled overnight in a refrigerator using 0.2 M cobalt chloride (CoCl2) solution. The CoCl2 was precipitated using ammonium sulfide (~10 drops in 10 ml saline), fixed in 15% formalin in seawater, dehydrated in ethanol, and cleared in methyl salicylate. I made an initial inspection and a camera lucida drawing of each fill with a Zeiss CM6 microscope. Many successful fills were silver intensified (Bacon & Altman 1977). Fills were re-hydrated, soaked in Timm’s solution (acacia, citric acid, sucrose) at 55ºC, and then placed into Timm’s solution containing 10% silver nitrate until the ganglia turned golden brown. Fills were again dehydrated, cleared in methyl salicylate, and re-inspected. Successful fills were drawn with a camera lucida or photographed with a 35 mm camera mounted on an Olympus BX50 microscope. Slides were converted to digital images and prepared for publication using Corel Photo Paint 12.0. Because the cobalt backfilling technique can be capricious, the number of cells reported is based on the maximum number of cells seen in at least two separate fills unless otherwise noted. A total of 107 backfills were performed on 32 individuals (22 of I. peronii, ten of I. alticrenatus). The results described are the same for all ganglia (there are no reported segmental differences in distal leg motor neurons; (Faulkes & Paul 1997) and both species unless otherwise noted. The gross anatomy of the central nervous system in Ibacus is similar to that of the scyllarid Thenus orientalis (Chacko 1967) and other decapods. Because the thorax of Ibacus is dorsoventrally flattened, the leg nerves, and particularly the proximal leg nerves, are considerably longer than in other decapod species (Faulkes & Paul 1997). Ibacus, or other scyllarids, may prove fruitful for examining neuromusculature of the proximal muscles, which have been well described in only a few cases (Antonsen & Paul 2000).The distal leg nerve, N1, divides into anterior ventral (N1AV) and posterior ventral (N1PV) branches (Elson 1996, Faulkes & Paul 1997), although this branching point is quite distal from the ganglia (particularly in posterior ganglia), in contrast to Pacifastacus leniusculus, Blepharipoda occidentalis, and Munida quadrispina, where N1 separates very near the ganglia (Elson 1996, Faulkes & Paul 1997). 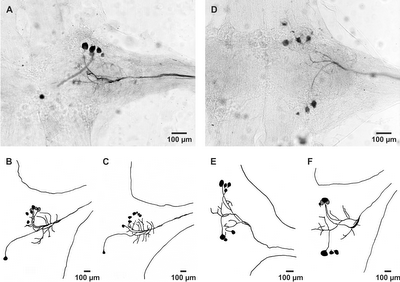 The cell bodies of the distal leg motor neurons in Ibacus are ~40-100 µm in diameter, as in other decapods (Wilson & Sherman 1975, Wiens 1976, Wiens & Wolf 1993, Faulkes & Paul 1997). The cell bodies are arrayed in three groups (Table 1), again like other decapods (Wiens & Wolf 1993, Faulkes & Paul 1997): an anterior-lateral group that contains about twelve cell bodies; a posterior-lateral group of three cell bodies, and; 3) a small posterior-medial cluster with at least one cell body (though this number is problematic; see below). The maximum number of cells seen by separate N1AV and N1PV fills in Ibacus was sixteen, although fifteen is a more conservative estimate due to the difficulty of resolving the number of cells in the anterior cluster (see below). This is identical to the sixteen cell bodies reported in J. edwardsii (Silvey 1981), and near the seventeen motor neurons that are predicted from data on other decapods (Wiens 1989, Wiens 1993, Faulkes & Paul 1997). Table 1. Number of distal leg motor neuron cell bodies in thoracic ganglia. Cell body position Ibacus spp. N1AV fills (Fig. 3A-C) show a large anterior cluster of cell bodies and one medial cell body. It is difficult to accurately resolve the number of neurons contained within the anterior cluster because it contains the most cell bodies, thereby increasing the probability of incomplete fills, and leading to cell bodies in one focal plane obscuring cell bodies in other focal planes. The anterior cluster is predicted to contain eight cell bodies, based on twelve cell bodies in this cluster in other decapods (Faulkes & Paul 1997), and that four fill through N1PV (below), which was seen in one fill in I. peronii fill; seven cell bodies were visible in multiple fills in I. peronii. N1PV fills (Fig. 3D-F) reveal an anterior-lateral cluster of four cell bodies and a posterior-lateral cluster of three cell bodies. No medial cell body filled from this nerve alone. That only one medial cell body was seen in these fills is consistent with data from J. edwardsii (Silvey 1981). Nevertheless, other research has shown at least two medial cell bodies, the stretcher inhibitor (SI; Wiens & Wolf 1993, Faulkes & Paul 1997) and the common inhibitor (CI; Bévengut et al. 1983, Moffett et al. 1987, Wiens & Wolf 1993, Bévengut et al. 1996, Faulkes & Paul 1997, Antonsen & Paul 2000). There are physiological data indicating that both the SI and CI are present in palinurans (Wiersma 1941, Wiersma & Ripley 1952). To examine the possibility that there are two medial cells present in Ibacus, I performed N1 backfills proximal to the point where N1 divides into N1AV and N1PV. In Ibacus peronii, multiple N1 fills clearly show two medial cell bodies, with well defined axons leading to them (Fig. 4A). These two cells are found in the relative positions previously described for CI and SI in other decapods, in which CI is slightly contralateral and posterior to SI (Wiens & Wolf 1993, Faulkes & Paul 1997). In Ibacus alticrenatus, no N1 fill revealed more than one medial cell body. To provide evidence that one of these medial cells is the common inhibitor, which innervates proximal leg muscles as all as distal (Cooke & Macmillan 1983, Wiens 1985, Wiens et al. 1988, Wiens 1989, Bévengut et al. 1996), I performed several fills with nerves to the proximal leg muscles (i.e., the elevators, depressors, promotors, and retractors). Although the exact targets of these nerves were not rigorously identified, a medial cell body was successfully backfilled through several different proximal nerves (data not shown), thereby indicating that CI is likely present. Two medial cell bodies were never seen by filling proximal nerves alone. Three fills that combined N1AV and N1PV showed contralateral processes extending from the one medial cell in two I. alticrenatus individuals (Fig. 4B). Although these were not consistently visible, such projections are noteworthy because no contralateral projections from any leg motor neuron have been reported in other studies (Wiens & Wolf 1993, Faulkes & Paul 1997). Similarly, several fills revealed axons that did not leading to a cell body within the hemiganglion, but projected anterior or posterior to adjacent ganglia or to the contralateral hemiganglion. Similar neurons were hypothesized to be neurosecretory cells (Faulkes & Paul 1997), which exit N1 in other decapods (Huddart & Bradbury 1972, Heinrich et al. 2000). Wiens hypothesized that there is one innervation scheme for the reptantian decapod legs, and wrote, “Although no palinuran species has as yet been reexamined, it seems very likely that this group will also be found to conform to this plan” (Wiens 1989). The data here have not yet confirmed this prediction. The map of leg motor neurons in the thoracic ganglia of Ibacus spp. differs slightly from both those of J. edwardsii (Silvey 1981) and other decapods (Faulkes & Paul 1997). All three projects agree on the presence of three cell body clusters: a large anterior-lateral cluster, a posterior-lateral cluster, and a posterior-medial pair. Wiens & Wolf (1993) reported a fourth cluster, consisting of a single anterior-medial cell body, in the crayfish Orconectes limosus, but this has not been reported in any other species. This study does not support the presence of four posterior-lateral cells in palinurans generally (Silvey 1981). One possible explanation for this discrepancy is that one of the poster-medial cells described by Silvey, PM2, is not a motor neuron. Cell PM2 in Fig. 3 of Silvey (1981) is much smaller (~25 µm) than most other cell bodies in that study (~100 µm). Other studies showed distal leg motor neuron cell bodies to range from ~40-100 µm (Wilson & Sherman 1975, Wiens 1976, Wiens & Wolf 1993, Faulkes & Paul 1997). Silvey also noted that PM2 “never filled sufficiently to be distinguished completely,” and weak filling is typical of putative non-motor neurons (Faulkes & Paul 1997). This interpretation significantly aids in harmonizing the proposed map of leg motor neurons in the ganglia across species. There are two medial cell bodies in Ibacus spp., but apparently only one routinely reaches the distal leg muscles. In crayfish, the two medial cell bodies have been physiologically identified as the common inhibitor (CI; Wiens 1976, Bévengut et al. 1983, Wiens & Wolf 1993, Bévengut et al. 1996, Antonsen & Paul 2000) and the stretcher inhibitor (SI; Wiens & Wolf 1993), both of which palinurans apparently have (Wiersma 1941, Wiersma & Ripley 1952). Fills made to include nerves to proximal muscles show two medial cell bodies in locations described for CI and SI (Wiens & Wolf 1993, Faulkes & Paul 1997). That one cell body fills through other proximal nerves is consistent with one of these two cells being CI (Bévengut et al. 1983, Cooke & Macmillan 1983, Moffett et al. 1987, Bévengut et al. 1996, Antonsen & Paul 2000). These data and there is only one medial cell in J. edwardsii (Silvey 1981) are consistent with the hypotheses that the SI does not have a medial cell body in palinurans (Faulkes & Paul 1997). 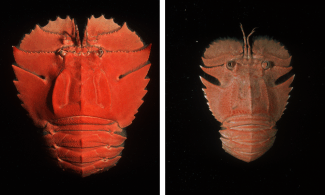 Given the difficulty in identifying an SI homologue in Ibacus spp., it is also worth noting that the only evidence of the opener inhibitor (OI) in palinurans (Wiersma 1941, Wiersma & Ripley 1952) is that OI is located in the posterior-lateral cluster in crayfish (Wiens 1976, Wiens & Wolf 1993), and that the same number of cells exist in that cluster in Ibacus spp. (this study). The physiological experiments required to test hypotheses of neural identity that are presented here are conceptually straightforward, requiring paired intracellular recordings of the innervated muscle and the motor neurons in a preparation (Wiens 1976, Wiens et al. 1988, Wiens et al. 1991, Wiens 1993). Unfortunately, spiny lobsters are often more difficult to dissect than crayfish or lobster (Wiersma & Ripley 1952; personal observation). Similarly, maintaining physiological activity in isolated thoracic ganglia can be somewhat difficult (Silvey 1981; B.M.H. Bush, personal communication). Notwithstanding these unresolved issues, this study indicates that while palinurans may differ from other reptantian decapods in their distal leg innervation, these differences are not common to the palinurids and scyllarids. Furthermore, these differences may not be as large as previously suggested (Faulkes & Paul 1997). Thus, these neuroanatomical data only weakly support the hypothesis that palinurans are an early diverging group in the phylogeny of reptantian decapod crustaceans (Fig. 2; Scholtz & Richter 1995; Ahyong & O’Meally 2004). Acknowledgements. Data collection for this project was carried out in the laboratory of Professor David L. Macmillan (Department of Zoology, University of Melbourne), who I thank for his guidance and support, and the wonderful opportunities he provided. John Ahern (Department of Zoology, University of Melbourne) provided assistance with animal care. David Paul (Department of Zoology, University of Melbourne) provided photographic assistance. Data analysis and manuscript preparation was completed under the auspices of The University of Texas-Pan American. This research was supported financially by a post-doctoral fellowship from the Natural Science Engineering and Research Council (NSERC) of Canada to ZF and by an Australian Research Council grant to David L. Macmillan. Altman JS, Tyrer NM. 1980. Filling selected neurons with cobalt through cut axons. In: NJ Strausfeld, TA Miller (eds. ), Neuroanatomical Techniques, pp. 373-402. Springer-Verlag: Berlin. Atwood HL. 1977. Crustacean neuromuscular systems: past, present, and future. In: G Hoyle (ed. ), Identified Neurons and Behavior of Arthropods, pp. 9-29. Plenum Press: New York. Atwood HL, Tse FW. 1993. Physiological aspects of presynaptic inhibition. In: SK Malhotra (ed. 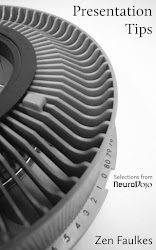 ), Advances in Neural Science, pp. 19-65. JAI Press. Clarac F. 2002. Neurobiology of crustacean walking: from past to future. In: K Wiese (ed. ), Crustacean Experimental Systems in Neurobiology, pp. 119-137. Springer-Verlag: Berlin. Harris-Warrick RM, Marder E, Selverston AI, Moulins M (eds.). 1992. Dynamic Biological Networks: The Stomatogastric Nervous System. Computational Neuroscience. Cambridge, The MIT Press. Krasne FB, Edwards DH. 2002. Crayfish escape behavior: lessons learned. In: K Wiese (ed. ), Crustacean Experimental Systems in Neurobiology, pp. 3-22. Springer-Verlag: Berlin. Pearlstein E, Cattaert D, Clarac F. 1995. Fictive posture and fictive locomotion are supported by different motoneuronal sets in the crayfish Procambarus clarkii. Nervous Systems and Behaviour: Proceedings of the 4th International Congress of Neuroethology, Cambridge, Georg Thieme Verlag. Schram FR. 1986. Crustacea. Oxford University Press New York. Wiersma CAG, Ripley SH. 1952. Innervation patterns of crustacean limbs. Physiologia Comparata et Oecologia 2: 391-405. Mendeley users can generate a reference using the COinS generator. Hat tip to William Gunn. Interesting article,however, I don't feel able to critically appraise it as I know little about the field. Perhaps if some of your peers had given it the once over and said it was fine for discussion then I might have felt more confidant in taking the results on board. Came across your blog when searching about publishing academic articles on blogs. Good job with publishing it open source. 1. In my field (human rights in the Middle East), knowledge is a public commodity that can affect real world perceptions of issues. If someone searches on Google about a subject on human rights (like religious freedom), I want them to find my blog. Anyone. Not just someone who has access to a library database (and has the wherewithal to find an article). 2. I include original Arabic text in my research. If someone searches in Arabic on Google, I want them to find my blog. Most journals limit original language sourcing in non-Western languages (transliteration is allowed). Publishing on a blog is simply logical if I want my research to be applicable in the real world, and accessible to real people who are looking for knowledge about issues. 3. I can't tell you the number of times I have wanted to read a journal article, and not been able to get access to it except through a lengthy ILL process. Even journals within my field. If I cannot read research and I have a lot of resources at my disposal, what about someone in the Middle East? Knowledge (at least in my field) is a public commodity, and should be in the public domain. I see the point of peer-review for scientific articles. No doubt. But liberal arts are different. Slowly but surely people can tell the quality of your research, and either accept or reject it. Even with a peer review process, I have been very unsatisfied with the quality of research in the fields I have studied. Not only is some information simply wrong (or misleading), but I am literally the only person who has written about some subjects. So, it makes me wary to contribute to a system that I have not benefitted from anyway. It's hard, because publishing is seen as a "seal of approval." But I believe the right is on my side. And given the number of hits on my blog...I know people are searching for info, and I am making a difference. I am looking for others who have taken a similar approach. Let me know if you have come across any others who publish academic quality research on their blogs.